My apprenticeship as an auto trimmer continues. In fact it seems that it could well go on for ever. At this rate I ought be a fully qualified stitcher and gluer in time for my telegram from the Queen – or King William by then. Earlier instalments of this epic tale have seen me slice and dice most of my fingers and inflict serial injuries to other regions as I attempt to swap velour seats and door trims for second-hand leather in the 1975 DS23 Citroen. I have triumphantly recounted my success installing the front and rear leather seats, but that is but the easy part of the transformation of the Pallas to full leather. This month, I have learnt how to remove old glue and gunk from the door inner panel. Sounds easy, doesn’t it? 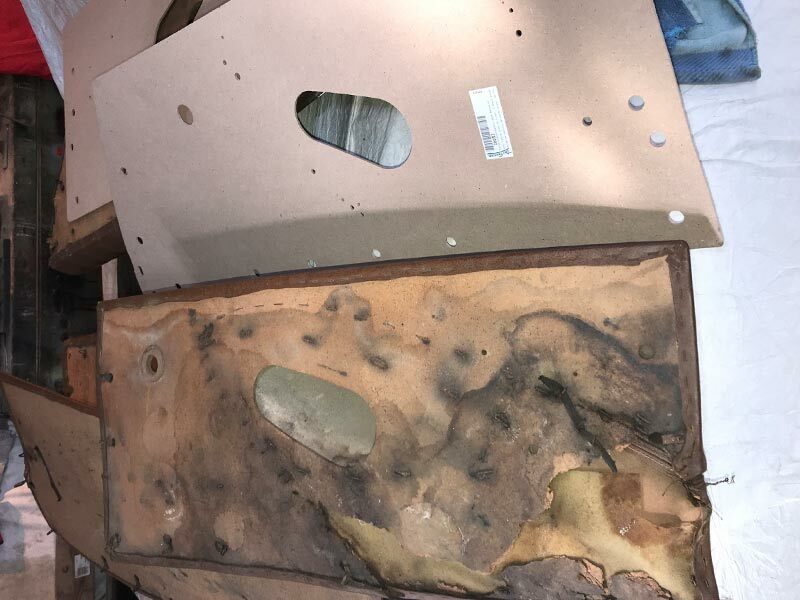 The water damaged old door cards need replacing, and new bare boards have been sourced from Europe. They arrive pre-cut and drilled to perfect dimensions. In order to avoid future water damage, the plastic waterproof door seals that need replenishing come in the same parcel. 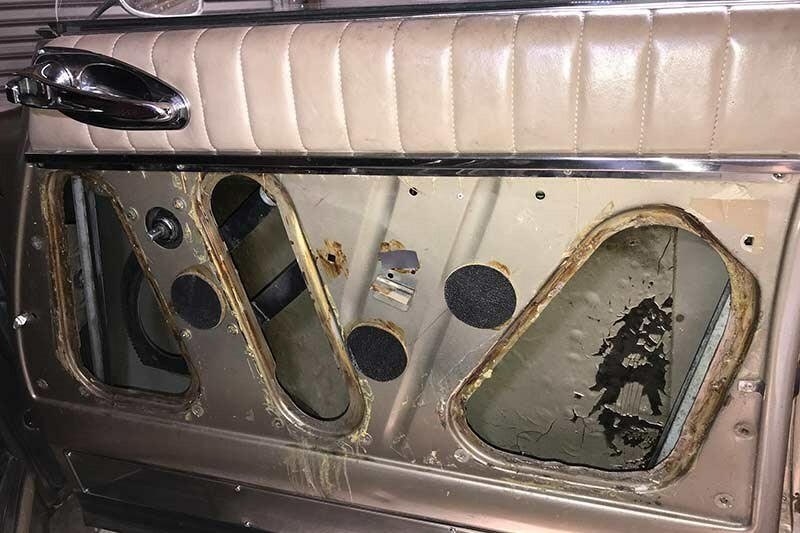 Even before that can happen, before even the old leather arm rests and door trim can be released from their staples and stretched over new cards, the door inner panels require a severe talking to. Previous owners – not blaming anyone here – have clearly taken a more liberal approach to trimming than is healthy. When the glue holding the water protecting plastic seals have lost adhesion, when water has seeped through the plastic membrane and soaked the back of the old door cards, the remedial action authorised by previous negligent and reckless custodians of MY car has gone no further than gaffer and packaging tape. How dare they be so derelict in their duty of care to a classic Citroen. Brutal. 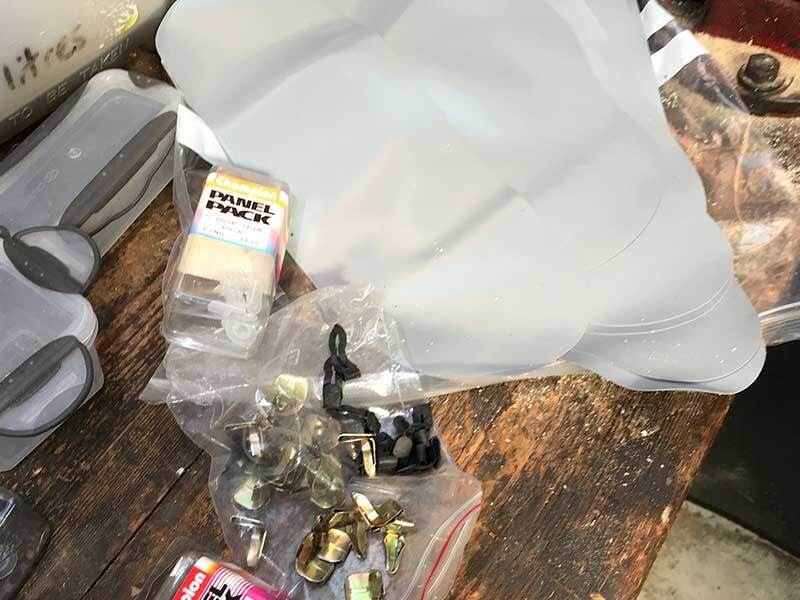 This lazy treatment for water-proofing the sponge-like door cards is akin to standing under a hose with a torn plastic bag on your head and wondering why you are feeling damp. It is worse than useless. It has helped to rot the very material it is supposed to protect. So back to basics it is. First we acquire some nifty new trim removing spatulas, in a variety of shapes and sizes. Next we manipulate them to release the door card by springing and popping the various trim clips – and discover half are missing. Then we discover that the other half that are still there have rusted. And many of the panel holes have lost their plastic plugs that hold the clips tight and prevent rattles and the spread of rust. Visits to trimmers and parts shops secure plugs and trim clips that will fit. Next I need clean metal to glue on the new water-proofing seals. So the agonising task begins – coaxing old brittle and stubborn glue remnants to surrender with the metal around the lips of the cut outs where the plastic seals go. New glue will not adhere properly nor provide a full seal to thick brittle and cracking cakes of old glue. And old glue there is plenty of. Archeological techniques applied to the excavation of my door – layer by layer – shows multiple sediments of differing substances. So how to soften and remove the gunk? Is there a short cut? I try turps. I try methylated spirits. Nope. I can’t use thinners as it will attack the paint. I get several commercial substances from the car shop, none of which works like magic. I use scrapers, razor blades, heat guns but it all comes back to the same thing – elbow grease and lots of swearing. If you could package and retail swearing as an aide to workshop efficiency it could resolve the trade deficit and repay the national debt. My back and legs cramp, my neck goes stiff and my arms turn to jelly before the job is half done. I have no idea what species of adhesives have been applied over the years. Analysis would probably find it’s a by-product of the space race. But whatever it was, they used a lot of it. My respect for auto upholsterers soars. I try to be tidy, keeping the mess and spills to a minimum. I fail. The bottle of degreaser with it’s lid off inevitably has an extraordinary capacity to be knocked over, leaving the garage floor sparkling and grease free. The cutting edges of the scrapers have a laser like focus on my finger tips and nothing saves me from serial infliction of multiple small nicks. And when the degreaser gets into fresh flesh – well, at least the wound is clean! "Stanley knives...but did they come in red?"